Whenever I open the Nishchintata Gallery, I am filled with delight in, and appreciation for, the ways that the black-and-white images of nature reveal the infinite play of light, shape, and texture. As I gaze at these images, I become quite still and peaceful. So I really appreciate all of these photographs, as well as the way that the order of the images allows them to flow so gracefully from one to the next. Thank you, Gurumayi, for offering this beautiful expression of God's bounty. The play of black and white, of shadows and light, within these photos is so beautiful. The photographer has caught the fine balance of harmony in these shapes. Though many of the images are of snow and winter's night, there is a calm and warmth to them. 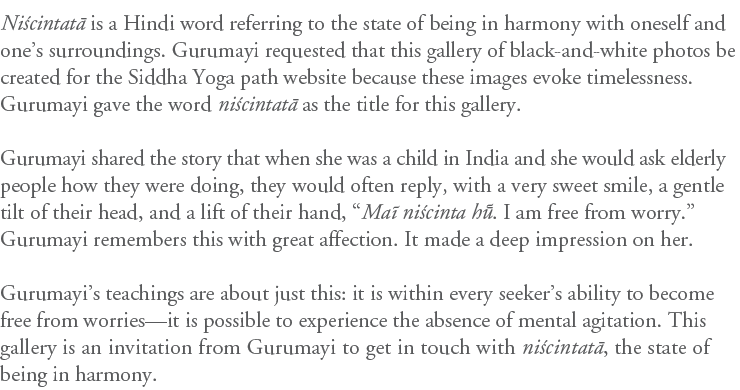 I experience the gift of nishcintata that Gurumayi is inviting us to get in touch with. I am grateful for these images; they bring me peace. How lovely it was to look at the tree branches reflected in the water. The blurred reflection, like an impressionistic image, took me beyond my concerns; the intricacy of the branches, their delicacy, reminded me of gentleness. Gazing at the picture of the two birds sitting next to each other on a branch brought me into a state of harmony. I experienced the unity between the two birds and, at the same time, the unity between them and me. I could sense our breathing together in complete harmony. I feel very grateful for this experience. When I view the beautiful photos of the Nishcintata series, my heart goes beyond the duality of the mind, and contentment arises. Only the harmony of oneness prevails. I feel that all is right in God's universe, and my mind rests. What beautiful photographs that still the mind, soothe the heart, and create an inner sense of fulfillment. The effects of these photos are immeasurable. Thank you, Gurumayi, for these remembrances of the beauty inside and outside. As I enjoy this gallery, I think of the way early photography was in black-and-white. I have come to associate each photo with the wonderful sense of a moment captured in time and yet having a timeless quality—embracing the past, the present, and eternity. In this way, the gallery seems ageless to me. It brings me back to my heart. It pulls me to a peaceful place within, where I can tap a wellspring of grace at any time. I love visiting this gallery. It always seems to restore a sense of balance in my life. The black-and-white photographs—with their continuum of shades of gray—convey equipoise, peace, and clarity to me. As I view the photos, I perceive the oneness that runs through nature and creation. I think of the way divergent colors in nature come together to create a totality, a complete whole, communicating harmony more powerfully together than they each do on their own. I feel a special peace and depth when I look at the black and white images. They remind me that God´s will is behind each little or big thing in this wonderful universe, and the essence of God´s will is bliss itself. Reflecting in this way, I understand that there is full, complete bliss in all the apparent limitations of life.